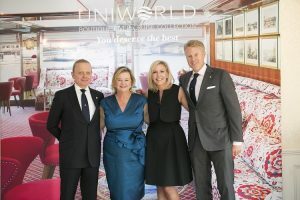 Uniworld Boutique River Cruise Collection, the world’s most luxurious all-inclusive river cruise line, announces its product line-up for 2019 including three new European cruises, enhancements to popular itineraries, a new ship on China’s Yangtze river and the debut of a fully renovated River Royale. According to Uniworld President & CEO Ellen Bettridge, plans for the coming year are aimed at continuing to differentiate the product, delivering to customers the world’s foremost river cruise experience and helping agents make the sale. Following the upcoming unveiling of its newest Super Ship the S.S. Beatrice, Uniworld will introduce a new ship to its guests on the Yangtze river in 2019, the Sanctuary Yangzi Explorer, selected says Bettridge for its “incredibly high standards of luxury,” including the largest cabins and suites on the river, all with private balconies, as well as the highest crew to passenger ratio on the river of 1:1. Other on-board facilities include an observation deck, two-floor theatre, library, and expansive spa, beauty and fitness facilities. Here, Uniworld also announces an extension to its 11-day Highlights of China & The Yangtze itinerary with the introduction of new six-day pre-trip to Mongolia including visits to the Gobi Desert and capital city, Ulaanbaatar. Other developments underway in 2019 include an interior transformation of the River Royale, Uniworld’s intimate ship in the Bordeaux region of southwestern France; the inclusion of onboard and onshore personnel gratuities for all Uniworld itineraries in Russia, Asia and Egypt and an expansion of the brand’s all-inclusive onboard beverage program to Russia, Asia and Egypt. Uniworld will also enhance several itineraries on rivers throughout the world in 2019. In Europe, after a hiatus in 2018, the company will bring back its seven-night Holland & Belgium at Tulip Time itinerary and expand from seven to 10 days its popular Jewish culture and heritage itinerary, Remarkable Rhine & Historic Holland. Along the Mekong, Uniworld has shortened its Ho Chi Minh City to Siem Reap itinerary to 13 days and introduced a new four-night extension to Hanoi and Ha Lon Bay that includes one night aboard a luxury junk boat. In India, Uniworld is enhancing its Golden Triangle & Sacred Ganges itinerary with the introduction of a comprehensive wellness program centred around the destination’s ancient tradition and practice of yoga. Available on every sailing, the complimentary program – led by a certified and resident yogi, will celebrate the holistic health benefits of yoga with daily sessions introducing the different types of yoga, group lectures and classes as well as individualised meetings, so that guests at every stage of their practice can participate in this culturally immersive program comfortably. An accompanying “Nutrition and Wellness Food” menu has also been developed especially for this program. Featuring organic items and guidelines for eating healthy, the menu will be available daily during breakfast, lunch and dinner service. This Indian itinerary also offers an exclusive Uniworld “ME to WE,” alternative pre-cruise option, an immersive and transformative guest experience that brings them closer to the local communities of the destinations Uniworld visits. In India, guests begin their 2-night tour with a Poja, a traditional Hindu prayer ceremony signaling the start of the experience, stay in the luxurious mountainside Aravalli Cottages and Tented Camp, participate in a community development project, sample traditional Indian food and bear witness to age-old Indian traditions. In Egypt, which Bettridge says is “rebounding to unprecedented levels,” Uniworld will introduce two new optional extension trips in 2019; a pre, four-night trip to Jordan with stops in Amman and Petra that includes a one-way flight between Amman and Cairo and a post, four-night extension to Jerusalem including a one-way flight between Cairo and Tel Aviv. Both offer luxury accommodations, sightseeing and transfers, and will match the high standards that guests will experience on the River Tosca. “Together with our agent partners, we finished 2017 as our best year yet – exceeding every expectation and laying the foundation for a tremendous future, which is coming to fruition now. 2018 Wave Season bookings are on pace to surpass last year’s record-breaking rate. This momentum makes it even more exciting to share our plans for 2019,” said Bettridge.